I invite you to listen to three voices with deep experiences in verbal communication and making connections. One of them even has a way to make your voice feel rich and warm like hot chocolate. It forms a good pairing with this podcast. Enjoy! 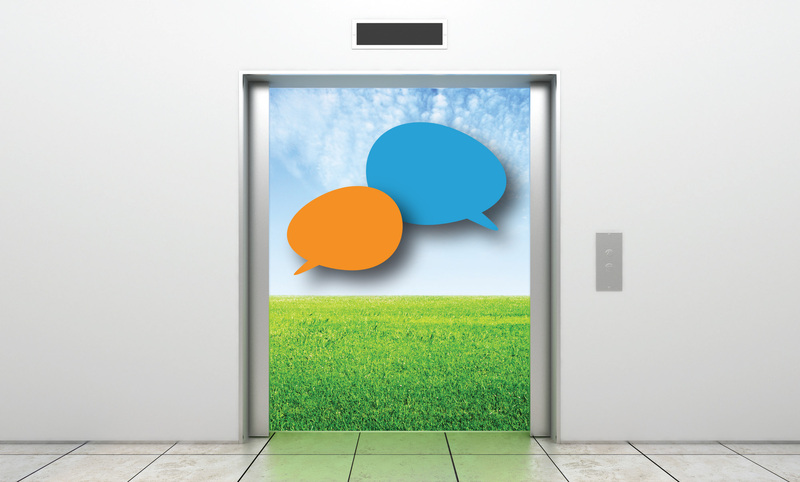 The best elevator pitch is about you. The door opens, you both step into the car and she pushes the button for the lobby. demands brevity and a stunning ability to leave a lasting impression on the other person. How do you make the best use of this moment? potentially large gain for your nonprofit. Granted that each time is unique, you can still have a game plan that will help you to begin from a point of clarity and confidence. Who is served by your mission? Come from a genuine place. his attention during the short ride. Therefore, by all means, make it personal. Your pitch is not a list. Too often, I hear nonprofit staff rattle off their programs while the other person’s gaze starts to wander. Once you lose eye contact with the other person, they have a great excuse to disengage. Your audience will remain captive with a conversation, not a set of bullet points. Now that you have her undivided attention, she may want to spend a few more minutes with you even after you’ve both left the elevator. This is your chance to switch the focus and make it about the other person. What can she gain from this brief encounter? Can she learn about recent critical developments in your field? Can he benefit from meeting someone on your board? At this point, be an active listener. Your pitch scales your mission down to a human level for the other person to grasp. By making it personal and meaningful for yourself, your passion for the cause will easily come across in an authentic manner. This is what resonates with your listeners. It will make them want to continue the conversation and find their own meaning in your mission. If you’re interested in how Barkada Circle can guide you in honing your elevator pitch, send us an email or call us at (773) 852-3522. What barriers do staff encounter when they engage board members to fundraise? I recently posted this query on LinkedIn based on this blog post in BoardSource about helping staff to fully engage board members in successful fundraising: http://exceptionalboards.com/2013/10/09/helping-our-staff-help-our-board-to-fundraise/. What ensued was an interesting exchange of perspectives. It certainly felt great to engage others in real discussion. The first challenge is an obvious one, many board members believe that it is the role of the staff to do fundraising. To engage your board, staff must provide a clearly defined process, who do you need the board to contact and for what purpose, specific points that need to be made to the donor, what type of support can the board member expect from staff, what are the time expectations from the board member? I also believe board members can’t fundraise for programs they don’t understand or a mission they may not be clear about. Your board orientation is the starting point for establishing these criteria. The board orientation is a crucial first step to getting everyone on the same page about mission, culture and expectations. Thanks for your comment, Dale! Board orientation is indeed very important. I also like one-pagers that members can keep on hand that summarize information from the orientation: basic info, mission, list of programs/services/etc. with one or two sentence descriptions, maybe a stat/metric or two. Ongoing and open communications is also key. In any case, I think it is important that board members receive training specific to your culture/needs/activities/approach, especially if they are going to participate in the asking directly. It is important for there to be consistency. It also can be a huge stepping stone on the path of members being able to take ownership of their work. As not every organization has experienced EDs or the means to employ someone specifically focused on fundraising/development, this may seem like a challenge. You can hire short-term consultants, but you can also recruit fundraising experts to your board who would be willing to provide that training (which could be part/all of their personal contribution). And don’t forget, those board members will need resources too, such as brochures or reports. Setting expectation is critical, so I certainly agree with the Board orientation comments. Melissa has a great list of points as engagement is the key from which the donative impulse flows. An additional point would be to have your nominating committee be composed of the most engaged Board members. From my experience, after the Executive and Finance committee, the Nominating committee, which should include the Board Chair and CEO, is the most important as it serves to recruit the types of individuals who will govern (and contribute to) your organization for the next decade. Generally, according to the laws of human nature, “like attracts like.” If your stronger members are organizing the recruiting, they are more likely to attract strong members. If this task is treated as an afterthought and includes Board members that are just given a role to have a role, you may get also-ran recruits. Pon: Excellent point, James! I’m on the Board of a nonprofit and we’re in the process of recruiting new members. Our President has been leading up the charge and we already have three great candidates express interest. In the 21st century, NFP boards need a process for allowing individual directors to have occasional informal contact with key staff members, with PROPER feedback to the chief executive, allowing for confidentiality if the staff person desires it. I have successfully followed this process as a director on both FP and NFP boards. Pon: Thanks, Eugene. In what context have you found this type of contact to be most successful? Eugene: Pon: I see the CEO needing to be a voting member of the board. As such he has responsibilities for operations and also is the representative of the staff on the board, developing a real board-CEO-staff partnership. This is not theory, it works in practice. I can provide some personal citations on implementation for you if you wish. . The ED and Boards need to identify what “skill sets” are needed on the Board, then identify who on your Board meet/have those skills; if needed skills cannot be filled by current members then start identifying potential Board members that can meet the skills — then go recruit those folks. Fundraising follows from you having a documented “fund development plan” that has measurable/actionable items in the plan. Constant evaluation of where you are on meeting the goals is required. You cannot wait until the established date of the goal to find out that you failed. No excuses. Pon: Great points, thanks Dwain! More and more, I’m hearing that we need to look beyond conventional fundraising and foster a true culture of philanthropy rooted in building relationships. What does this look like to you? Dwain: Pon thanks. Building relationships with potential donors is critical and doing that well requires pairing up the right board member with the donor. Who will have the “chemistry” to get the intended result? I definitely would have the CEO/ ED as a voting member. Many bylaws exclude that. I have been a nonvoting ED on a board. I found that if you “work” the influential members you can get your vote in. Pon: Would you say that having the CEO/ED as a voting member on the Board is more common in for-profit corporations? Dwain: Pon, my for-profit experience has been in very large corporations. The CEO/ chairman have been voting members. In the nonprofit organizations it is even more vital that the ED have a vote — why? The ED is more aware of the business issues than any board member. Eugene: Dwain: I totally agree. SEE: http://nd.alliance1.org/content/what%E2%80%99s-name-benefits-presidentceo-title. Pon: Yes more common in FPs. Some NFP state statutes list it as a conflict of interest for the CEO to be a voting member of the board, or even being a nonvoting board member. Quite antiquated thinking in my opinion. See link above. Pon: It seems to me this conversation can easily/naturally flow into the subject of trust building between board members and staff. Eugene: Yes; Trust has to be a critical element. Many thanks to Dale Otto, Melissa Kaestner, James Garland, Eugene Fram and Dwain Cox for contributing to the conversation. Planning educational programs has been a passion of mine ever since I began working with nonprofit organizations. It’s exhilarating when great minds connect to spark conversations that can bring about the next game changer. This year, I’m active in the American Marketing Association, Chicago Chapter as Chair of their Nonprofit SIG (Special Interest Group). 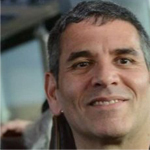 I’m also thrilled that Carey Kogol, Development Director at i.c.stars, joins me as Co-Chair. The SIG members recently designed the 2014 program series with Mission-Driven Marketing as its overarching theme. 1) Do you see opportunity in a crisis? An economic or financial crisis should prompt you to reexamine your strategy and how you operate. A change in leadership can open the door to fresh new thinking. When you let challenges push you beyond the status quo, you get to a higher level of articulating your mission. How do you change the conversation within your organization to encourage a new way of seeing and thinking? 2) Do you tell your story in good times and in bad? Sharing your story, even if it’s one of hardship, can stimulate empathy and even increase giving, especially if the external challenge aligns with your mission. When you make it known that the people you serve are in greater need than ever during the downturn, chances are it will resonate deeply with donors, which will motivate them to give more than they had previously. How could reaching out to your community with an honest appeal turn your challenge into a success story? 3) Is your board invested in the success of your organization? A strong, engaged board can be one of your greatest assets, both to help you maintain perspective on imminent or ongoing challenges and to provide practical advice for dealing with them constructively. A highly invested board should be asking for regular updates on strategy, operations and outcomes. If your board can’t be counted on in crises or other times, it’s time to wake it up or break it up. How well do your board members understand their roles in marketing the organization’s mission? Sign up today and participate in the next game-changing dialogue for the nonprofit sector. The freedom to move is at the core of living. 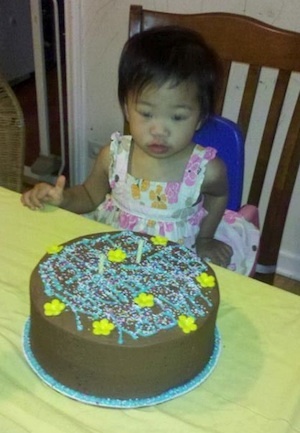 Over the Labor Day holiday, my family and I celebrated the golden birthday of my youngest niece. Ellie turned two on September 2nd. My brother Ray, Ellie’s dad, said that he was looking at old pictures of us when we were kids earlier in the week and he noticed how Ellie’s face closely resembled mine when I was her age. It sure would be fun to watch her grow up and see many faces in the family tree reflected in hers. Ellie’s strong independent personality clearly shows how she takes after her proud uncle, although I wouldn’t wish for her what I’ve recently realized to be a commonly shared family gene. Every now and then, if I don’t watch what I eat, I suffer from a mild to severe gout attack. Gout is a form of arthritis. It occurs when uric acid builds up in the bloodstream and causes inflammation in the joints. Acute gout is a painful condition that often affects only one joint. Chronic gout is repeated episodes of pain and inflammation which may affect more than one joint. Ray has it. Some of my aunts and uncles have it. My grandmother had it. My first trip to New Orleans in 2010 triggered my first severe flare-up. I literally ate my way through this lovely city, enjoying the best seafood gumbo, barbecue shrimp, soft shell crab, and red beans and rice – a menu rich with uric acid. Thankfully I was already back in Chicago when pain struck. It was unbearable. Who knew how pain in one joint – the big toe on my right foot – could paralyze my entire existence? I thought the pain would go away overnight, but I cried myself to sleep. The next day, my doctor prescribed allopurinol and told me to take 800 mg of ibuprofen every four hours. That was the only time I felt total relief from the pain. I had to cancel business appointments for the next 3 days and didn’t reschedule until I was confident I could walk again, even with a cane. Never in my wildest thoughts did I expect to develop arthritis. Only then did I begin to seek more information about it, about other people – including children – who have it and how they cope, and available resources to help people like me live a better life with arthritis. At the core of this effort, the Arthritis Foundation leads the way. Founded in 1948, the Foundation helps people take control of arthritis by providing public health education; pursuing public policy and legislation; and conducting evidence-based programs to improve the quality of life for those living with arthritis. They are also the largest private, nonprofit contributor to arthritis research in the world, funding more than $450 million in research grants since 1948. 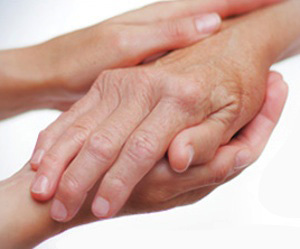 There are a number of ways to become involved with the Arthritis Foundation. Whether you become a member, or make a donation, your contribution goes to support cutting-edge research and scientifically proven programs designed to help people with arthritis. For every dollar donated to the Arthritis Foundation, 78 cents goes directly to fund research and activities for people with arthritis. Getting involved doesn’t require a major donation or major time commitment. Attending a fundraising event – be it a fun run, breakfast or gala, or the Arthritis Walk – is another way to help. 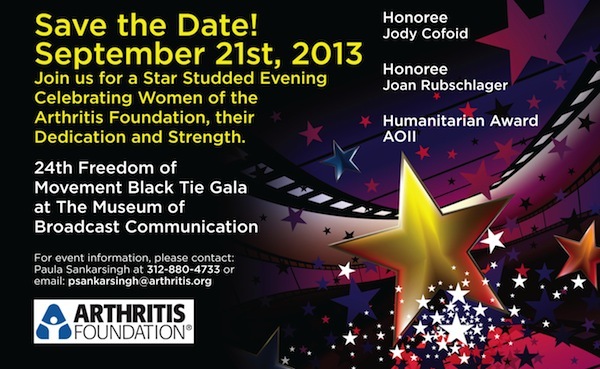 Join me on September 21, 2013 at the Arthritis Foundation’s 24th Freedom of Movement Gala and support this worthy cause. With your help, people with arthritis like myself can live fully and thrive. Watching my niece, Ellie at her birthday party reminded me how fast kids grow up. What a joy if I could be there with her every step of the way. For more information and to purchase tickets, go to www.affreedomofmovement.org.